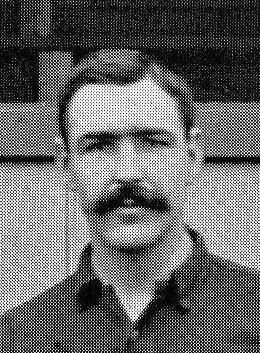 Caesar Jenkyns – First Arsenal player to appear in an international match. To celebrate Movember we recall the “Victorian Souness”. The flamboyantly named Caesar Augustus Llewellyn Jenkyns was born in Builth Wells, Wales in 1867. After playing for Builth Wells and amateur sides in the Birmingham area, he joined Small Heath, now known as Birmingham City, in 1888. He established himself at Small Heath as a rugged defender and captained them to promotion from the Second Division in 1894 as well as winning caps for Wales. 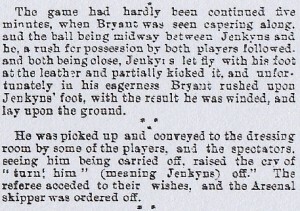 Jenkyns moved to Woolwich Arsenal in April 1895, after being released from Small Heath for assaulting two spectators. Ironically he came to Woolwich just after the club’s ground ban had been lifted. He was immediately made captain and, playing during the 1895-96 season, made his mark in Arsenal history by becoming the club’s first ever international player, after winning a cap for Wales against Scotland on 21st March 1896. He eventually won 8 caps during his career. Playing at centre-half, Jenkyns scored six times in 27 league matches for Arsenal and was one of Woolwich’s star players. His appearance and style of play have been likened to a “Victorian Souness”. Whilst at Small Heath he had been sent off four times in an era when a dismissal was incredibly rare. It took Caesar only 9 games at Arsenal before he was once again ordered from the field in an away game at Rotherham on 26th October 1895. Though it does appear the crowd were instrumental in his dismissal. In the summer of 1896 he moved to Newton Heath. After one season in Manchester he spent five years at Walsall before playing for Coventry and then drifting into amateur football with Unity Gas and Saltney Wednesday. Following his retirement from football he became a publican and then joined the police force – no doubt crime rates fell dramatically during Caesar’s tenure. Please see http://www.historicalkits.co.uk/ for the confirmation in the Latest News & Updates section on dates ‘1 March’ ,’29 March’ , ’15 May’ and ’18 July’ of our work in getting the club’s 1895-96 kit being denoted as red shirts on this important site and not the incorrect striped aberration it was assumed in the club’s Official Arsenal History. Corrected 1895-96 colours: http://www.historicalkits.co.uk/Arsenal/Arsenal.htm . Thanks to David Moor who runs the historical kit site.